Surveillance cameras are everywhere in China. A reporter has a chance to try on a pair of facial recognition glasses and see the world through the eyes of local police. ZHENGZHOU, China — They perch on poles and glare from streetlamps. Some hang barely visible in the ceiling of the subway, and others seem to stretch out on braced necks and peer into your eyes. Surveillance cameras are everywhere in China. I pass dozens on my 30-minute commute in Shanghai. After a while, they mostly blend into the background. But when spotting a new one, I wonder about them. Is anyone watching? Is a computer parsing the feed? Is it even on? Trying to get to the bottom of these questions can be infuriating. Chinese people are often unwilling to talk about their run-ins with the police. And the authorities are usually under standing orders not to talk to foreign journalists about much of anything, let alone cutting-edge technologies that snoop on criminals. So when I got the chance to see the world through the eyes of a police camera, it was oddly exhilarating. As it goes with reporting in China, often you just have to show up, camp out and hope for the best. In my case, patience and a hefty dose of luck paid off. The opportunity arose during a reporting trip to the central Chinese city of Zhengzhou several months ago. A colleague and I had traveled there to try to learn about facial-recognition glasses the police had been experimenting with before the big Chinese New Year holiday. When we first got to the city’s train station, a police officer gleefully likened the specs to a pair in “Mission: Impossible.” But then press officials rebuffed requests to try them. The glasses had been on display, but no longer, they said. We roamed the cavernous train station, hoping to catch a glimpse of them while taking in the scenes. Often in China, the mundane contains a bit of the absurd. On the second floor, the military was decamped to help with crowd control before the holiday. Their green camouflage tents, pitched inside the building, stuck out inside the drab gray station. Outside the camp was a sign warning all who approached that they were entering a battlefield. Below, on the departures floor, janitors had attached mops to the front of motorized scooters, cleaning the large marble floors with the efficiency of a Zamboni. 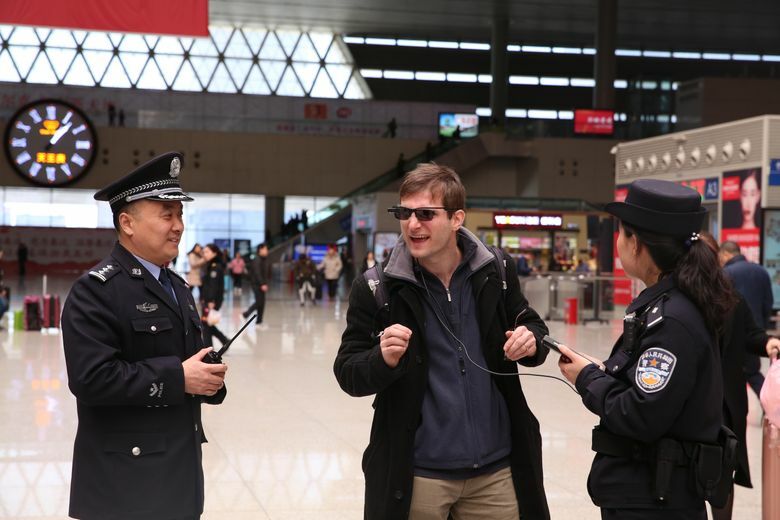 Within a few hours, we spied Shan Jun, a deputy police chief, who was demonstrating the glasses amid the crowds of travelers heading home for the holiday. It turned out they were still on display for news media, but just the state-run kind that Beijing controls. We tagged along and caught a break. Shan, who was affably holding court, gladly handed over the device to try. One of the more dystopian tools of China’s burgeoning surveillance-industrial complex, it was not exactly slick or really all that functional. A small camera is mounted to a pair of sunglasses. The camera is then connected by wire to a minicomputer that looks and works a bit like an oversize smartphone. The device checks the images snapped by the camera against a database. In essence, it’s a moving version of the photo systems that some countries have at customs checkpoints. With a bit of squinting and adjustment I found my right eye looking through a view finder like one on an old video camera. First I was instructed to aim it at a female officer. A small rectangle appeared around her head, and after a few seconds, the screen displayed her name and national identification number. I then repeated the process on Shan. Emboldened, I tried the glasses out on a group standing about 20 feet away. For a moment, the glasses got a lock on a man’s face. But then the group noticed me, and the man blocked his face with his hand. The minicomputer failed to register a match before he moved. Seconds later, the people scattered. Their reaction was somewhat surprising. Chinese people often report that they’re comfortable with government surveillance, and train stations are known to be closely watched. The logic often expressed is that those who are law abiding have nothing to fear. The men fleeing from my techno-enhanced gaze clearly felt differently — and I assume they weren’t criminals on the lam. Having a foreigner like me leering at them was certainly unusual. But later, as I watched the police continue to demonstrate the device, I noticed a similar pattern, if less exaggerated. The curious clustered to check out this brave new tech, but plenty of others strode quickly away, faces turned. In some ways, a lack of information has conditioned such behavior. The abilities and intentions of the authorities here are rarely clear, and uncertainty is part of the point. The less people know, the more they need to use their imagination. China’s surveillance state is far from perfect, but if people don’t know where it excels and where it breaks down, there’s a better chance they’ll assume it’s working and behave. With so much obscurity, many Chinese people see the authorities for what they are — erratic, unrestrained and now equipped with unpredictable new powers. The group in the train station was simply making a prudent choice and giving the police, their goofy electronic glasses and their strange foreign friend a wide berth. Many critics call China’s surveillance ambitions Orwellian, and they are. But for China today, the world imagined by Franz Kafka offers a closer vision: bureaucratic, unknowable and ruled by uncertainty as much as fear.